I also see the potential of Timeline as having the ability to allow people such as myself to use Facebook as a means to interact with family , close friends and collegues and use it as the amazing networking tool that it has become in my life. Well today a friend and collegue shared an amazing post which is always the case with Roseli A. Bakar of EzyBlogger Fame. 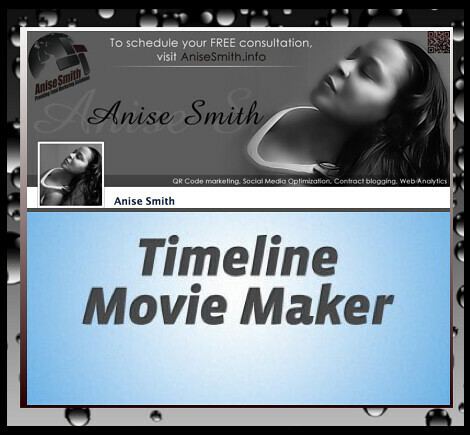 This post displayed a really cool tool that allow you to make a movie from your Facebook Timeline. How cool is that? Well, I had to test it out, you just to make sure it worked properly. :-P. Take a look at the video below. Also check out the additional resources section which will give you much more practical advice on implementing Facebook Timeline. Anise! This is awesome!! One of the reasons I appreciate you so much is the LOVE of tech and cutting edge we share. Great post Lady A.
Hi there Nakeva! Thank you SO much! I Eat, Sleep and Breath this stuff! YOU ROCK as usual! Anise, thanks so much for posting this and thanks Nakeva for sharing!!! I just made my Facebook Timeline Movie and I LOVE IT! Hi Danielle! You are very welcome! I LOVE Timeline, I made the movie because I figured if more people got a bit of a look into how cool it was they would really take the dive in and enjoy it! Glad you LIKE Timeline, is is awesome sauce. Glad Nakeva shared..she ROCKS!